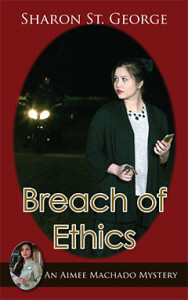 Breach of Ethics ($16.95, 342 pages, ISBN: 978-1-60381-227-6) is the third book in a mystery series featuring forensic librarian Aimee Machado and set in Northern California. When Aimee’s boss is implicated in the murder of a doctor, Aimee tries to find out whether he was killed because of his womanizing or his official recommendation involving custody of a child prodigy patient. “Another riveting mystery from the pen of Sharon St. George, Breach of Ethics clearly demonstrates the author’s total mastery of the genre. Very highly recommended for community library Mystery/Suspense collections.” Read more…. “The characters are all unique and each claim your attention. Breach Of Ethics is a clever murder mystery, loaded with twists and turns and red herrings that will leave you guessing all the while you are flipping pages to find out what happens next. Ms. St. George has provided us with an action-filled thriller.” Read more…. Forensic librarian Aimee Machado has a new title: Director of Ethical Affairs. At other hospitals this position might be dull: not at Timbergate Medical Center in Northern California. Armed with impressive jujitsu skills, Aimee breaks up a fist fight during a meeting and soon finds herself embroiled in yet another murder investigation. Dr. Gavin Lowe, one of the combatants in the dust-up, is found shot dead in the office of his adversary, Aimee’s boss Jared Quinn. The security cameras did not detect the killer coming or going. Were they tampered with? The police believe Quinn did the deed, but Aimee is unconvinced. She was present when the two men made their peace; unfortunately, there were no other witnesses. Is Aimee a suspect? At the time of his death, Dr. Lowe was treating ten-year-old piano prodigy Natasha Korba for appendicitis and malnutrition, a byproduct of her stepfather Abel Gailworth’s cult of veganism. Natasha’s grandfather Hector Korba, president of the hospital’s governing board, is fighting for custody. Was the killing prompted by the custody battle? Or did Dr. Lowe’s wandering eye seal his fate? Aimee’s on-and-off-again boyfriend Nick, her friend Cleo, and her charming brother Harry are on hand to help uncover the truth. What they discover only poses more questions. Meanwhile the killer is fully aware of their investigations, once again putting Aimee in mortal danger. Sharon St. George’s writing credits include three plays, several years writing advertising copy, a book on NASA’s space food project, and feature stories too numerous to count. She holds dual degrees in English and Theatre Arts, and occasionally acts in, or directs, one of her local community theater productions. Sharon is a member of Sisters in Crime and Mystery Writers of America, and she serves as program director for Writers Forum, a nonprofit organization for writers in Northern California. For more information, click here. “You are Miss Machado, aren’t you?” Hector Korba said. The distance of twenty feet from the library entrance to my desk seemed to shrink under his long strides. “Yes, Mr. Korba. What can I do for you?” I stood up, which only put me at eye level with his chest and brought to mind David and Goliath. Some powerful men don’t look the part, but that was not the case with Korba. “You know about my granddaughter?” His voice, a deep bass, rumbled from low in his chest. I didn’t wish. I was already looking up at the man. Any higher and I’d develop a kink in my neck. Curiosity about his visit burned deep. He didn’t take long to get to the point. “That’s right.” Where was he going with this? No place I wanted to go. I had already gone rounds with Quinn and Dr. Snyder about the minutes; now I had to refuse to discuss them with the president of TMC’s governing board. “I want to read your minutes. I want to see what they say about my Natasha.” His Natasha. No beating around the bush. Natasha belonged to him. In his mind, she was not her mother’s child, and certainly not her stepfather’s. Korba’s demand forced me into a gray area. Like Quinn, Korba was an ex-officio member of the Ethics Committee, and I wasn’t sure his status allowed him access to the minutes. This situation was even more problematic. Protocol had dictated that he be excluded from the meeting because of his relationship to the patient whose case was being discussed. Until I could get an opinion from Cleo—or failing that, from our legal counsel—I was not going to let him see the minutes. I hesitated, praying silently for a convenient interruption—a phone call, another patron walking in, a slight stroke. His, not mine. But he loomed over me as if his wish were my command. “Situation? What situation?” He folded his arms across his broad chest. “All right, enough. I understand.” Korba surprised me by smiling. The smile was a little creepy on a face as large as his, with bold features that seemed carved from granite, but apparently he intended to back off, at least temporarily. “My wife is gone, too. Her heart was weak. A year ago, it stopped. Natasha is all I have now. Her mother, my former daughter-in-law, is under the spell of that huckster, Gailworth.” He worked his mouth as if the name left a foul taste. “I’ll call Dr. Snyder about the minutes, Mr. Korba. If she tells me you may see them, I will let you know.” I maintained eye contact, hoping to convince him that was my best offer. “Do as you must,” he said, “but take a word of advice. If you wish to succeed in life, you must learn your job well enough to make your own decisions.” With that, he strode out of the library. I felt the floor shake with each of his Goliath steps. I called Dr. Snyder’s office immediately, leaving a request for a callback with her office manager.